Supreme Court of Canada chief justice Richard Wagner speaks during the welcoming ceremony for Justice Sheilah Martin, in Ottawa on Mar. 23, 2018. A Federal Court judge has accused the country’s chief justices, including the Supreme Court’s Richard Wagner, of becoming a law unto themselves in the disciplining of judges, reigniting a debate about who has jurisdiction over the bench. Justice Girouard asked the Federal Court to throw out the recommendation, saying the council’s decision-making process was unfair. The council, a body of chief and associate chief justices, argued that the court had no jurisdiction to review its recommendations. Justice Noël was scathing in rejecting that notion, ruling that his court does indeed have the authority to review the council’s recommendations. “It is inconceivable that a single body, with no independent supervision and beyond the reach of all judicial review, may decide a person’s fate on its own,” he wrote in a 110-page ruling released last Wednesday. 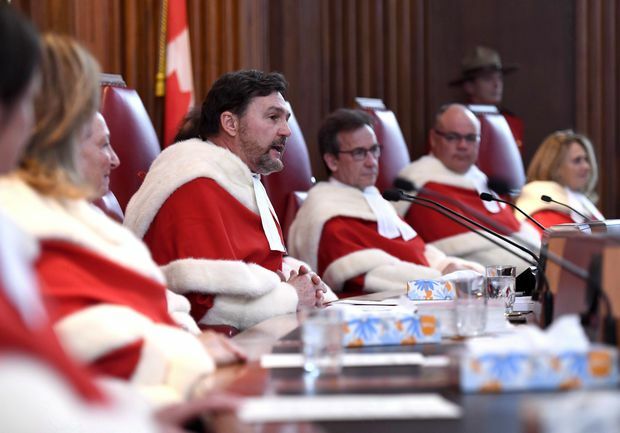 The disciplining of judges raises questions of judicial independence, which legal observers view as a near-sacred aspect of Canada’s legal system. Created in 1971, the judicial council was set up to balance accountability and independence. Ultimately, any recommendations for removal must be approved by the federal Attorney-General and adopted by Parliament. Justice Noël ordered the council to turn over its decision-making records in the Girouard case within 20 days. He also said the case will be heard on an expedited basis because of delays caused largely by the judicial council, whose chief justices, he said, have been busy exhorting others in the legal system to be conscientious in their use of resources. A lawyer for the council, Alyssa Tomkins, tweeted that the court may have misunderstood the council’s position. As summarized by Justice Noël, the CJC argued that its internal appeal mechanism is more effective than an appeal to the Supreme Court, because that court has just nine judges, while the council has at least 17, all of them expert in the administration of justice. A spokeswoman for Chief Justice Wagner referred a request for comment to Norman Sabourin, the CJC’s executive director. In an interview, Mr. Sabourin called the Noël decision exhaustive and well-reasoned, and said the council has not decided whether to appeal it. He said he did not wish to comment on the judge’s criticism that the council had shown the court disrespect. He added that the CJC has proposed to Ottawa changes to the legal process that would place five to seven senior judges as the final court of appeal for disciplinary matters. Montreal lawyer Gérald Tremblay, who represents Justice Girouard, declined to comment while the case is continuing. Justice Noël said he couldn’t understand why the council would challenge the court’s jurisdiction, when it lost the same challenge just four years ago – and then filed, and subsequently withdrew, an appeal. He also said the jurisdictional challenge came as the council was being asked to turn over its decision-making records, raising questions as to whether the chief justices were trying to avoid transparency. Justice Noël called one act in particular “unprecedented,” after the council’s executive director, Mr. Sabourin, sent an e-mail to the court saying the council was challenging its jurisdiction, and specifying that all correspondence be addressed to Chief Justice Wagner. Sending an e-mail (and not even one from counsel) is an informal and disrespectful way to deny a court’s jurisdiction, according to Mr. Sossin. Justice Noël went so far as to wonder whether Chief Justice Wagner and the judicial council attempted to improperly pressure the federal Attorney-General to remove Justice Girouard while the disciplinary case was still subject to a court challenge. Chief Justice Wagner had held a news conference in June at which he publicly criticized Attorney-General Jody Wilson-Raybould for not having announced a decision on the Girouard case, four months after the recommendation for removal. But Justice Noël said the public criticism was improper because the question of judicial review was before the Federal Court at the time. An article reporting Chief Justice Wagner’s comment referred also to meetings between the judicial council and Ms. Wilson-Raybould. The judge wondered in his ruling whether there were inappropriate backroom conversations about the subject of a court challenge. “All of this leads me to question whether the CJC was pressuring the minister to proceed with Justice Girouard’s removal without regard for the judicial proceedings that are legitimately before this court,” he wrote. In the end, Justice Noël said he accepted at face value an assurance by lawyers for the CJC that the Girouard file was not discussed with the minister. But he added that he will presume “that the CJC will henceforth limit itself to making its case before the courts” − that is, rather than in the media. He cited other ways, too, in which the judicial council had shown disrespect for the court process. For instance, “three orders had to be issued to persuade the CJC to demonstrate a degree of respect for the court,” such as filing its decision-making record in the Girouard case.